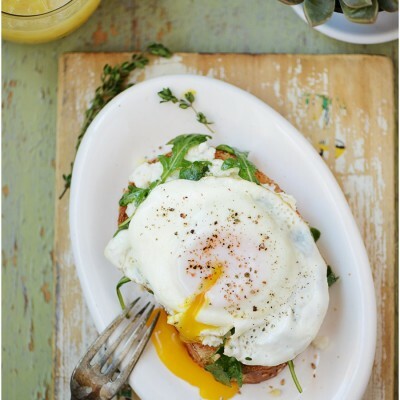 Make this healthy Open Face Breakfast Sandwich layered with an herb ricotta mix, arugula salad and topped with a fried egg. So delicious you’ll want to enjoy it for any meal! I’m one of those that LOVE breakfast and can have it any time of the day. This recipe can make a quick, easy and light lunch or dinner. The beauty of it is that it’s very flexible and you can substitute in your favorite ingredients. First start with making the Ricotta mixture by combining the ricotta with 1/4 teaspoon salt, Parmigiano-Reggiano cheese, and thyme. Set aside until ready to use. PRO TIP!! Make a day ahead to save time during the morning. Now coat both sides of the bread with cooking spray and toast until lightly golden using your preferred method (broil, toaster or grill). Note: Using cooking spray instead of butter will save you some calories. But if butter is your thing, then go for it!! Just adjust your calories accordingly if you’re currently tracking them. Next make the arugula mixture by combining the arugula with 2 teaspoons olive oil, the fresh lemon juice, 1/8 teaspoon salt, and 1/4 teaspoon pepper; toss gently. 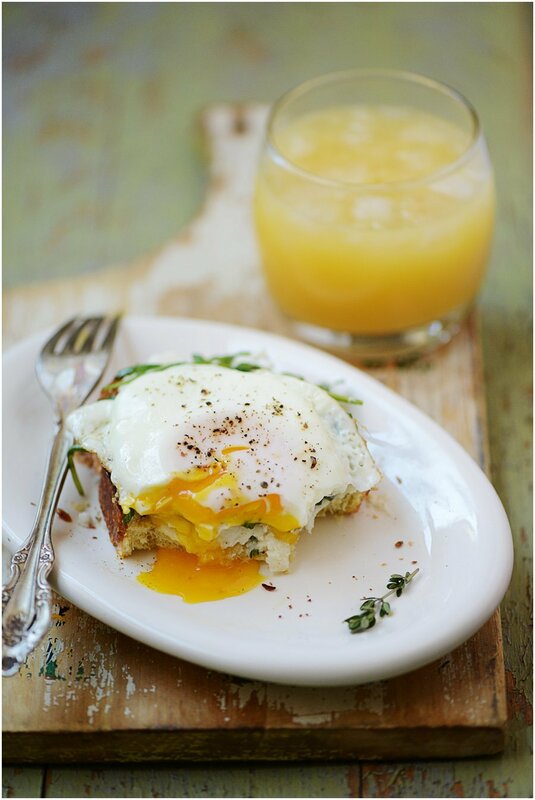 Last assemble the toast by adding a layer of the ricotta mix, arugula salad, top with cooked egg, add salt & pepper to taste and it’s ready to enjoy! This recipe has been adapted from Cooking Light Magazine. 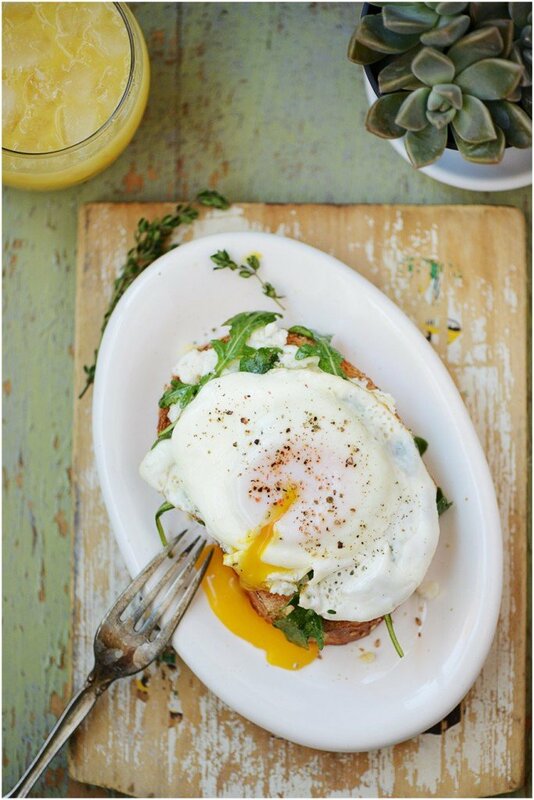 Perfectly toasted bread layered with an herb ricotta mix, arugula salad and topped with a (fried) egg. Arugula mixture: Combine the arugula with 2 teaspoons oil, juice, 1/8 teaspoon salt, and 1/4 teaspoon pepper; toss gently. 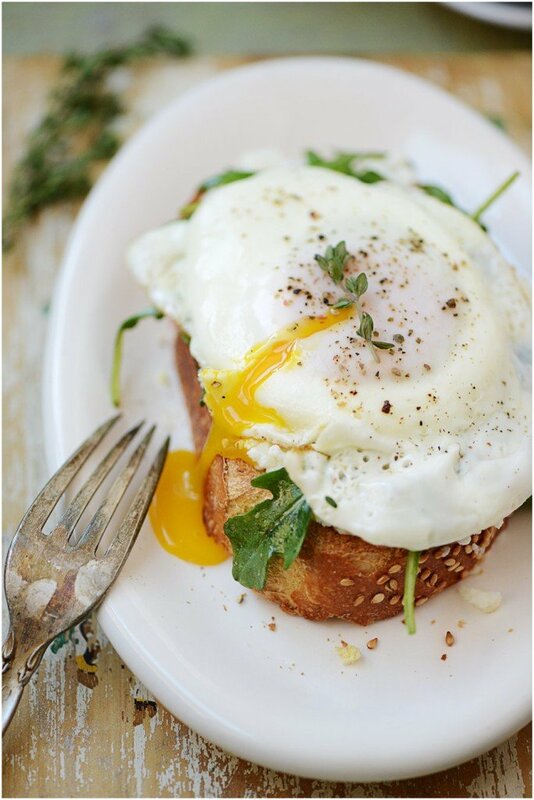 Cook the eggs: In a nonstick saute pan over medium heat, add 1 teaspoon of olive oil. Crack eggs into pan and cook for 2 minutes. Cover and cook for an additional 2 minutes or until whites are set. Remove from heat. Ricotta mixture: Combine 1/4 teaspoon salt, ricotta, Parmigiano-Reggiano, and thyme. 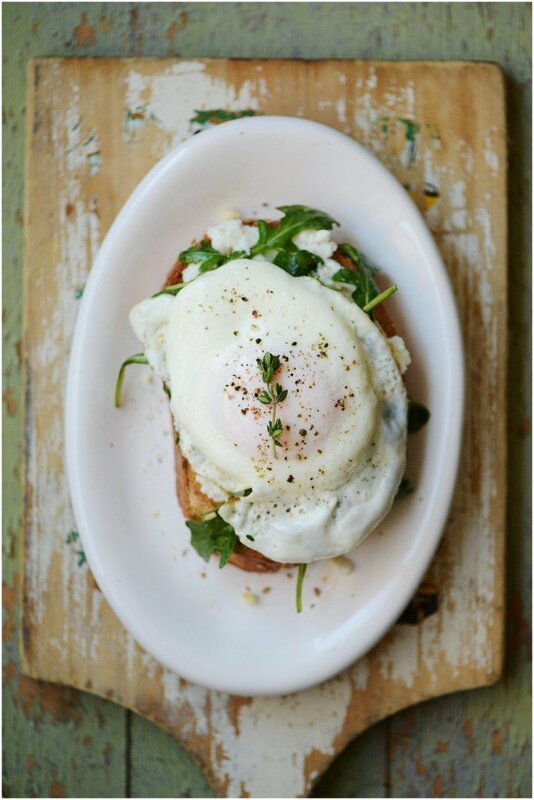 Assemble sandwich: On the toast add a layer of ricotta mix and arugula salad, top with cooked egg, add salt & pepper to taste. The calorie count is just an estimate since it depends on the toast that you use. For this recipe I used a toast that has 70 calories. Looking for another easy and healthy breakfast recipe? Try these Lemon Chia seeds Protein Pancakes! You could also make them at the same time and serve them for brunch! You will truly impress your family or guests! I love the ricotta on this!! Such a yummy meal! I agree! Ricotta makes everything better! Thanks for stopping by Katrina! OMG this looks outstanding! I’ll have to make this.